The Optimist Club of Grand Strand, SC and The First Tee of Myrtle Beach combined forces to host a junior golf tournament on August 29. They have shared a 3-minute video of the fun. Gotta love that headline, especially if you are an old-timer in an Optimist Club. You can probably guess that old-timers are senior members of any Optimist Club. They are a revered group and these days, being an old-timer doesn't always refer to age, but rather to length of service. With more than twenty years of service in my Optimist Club career, I have in fact become officially an old-timer. But I digress. The reason for this post was both to smile at the headline and to recognize a really great project being performed with the Optimist Club of Pembroke Pines, Florida. The Optimist Club has started up a junior golf program. To support their efforts the Hollybrook Golf and Tennis Club Men's Golf Association is collecting used golf clubs and donating them to the children in the Optimist program. One look at the picture and you can tell these "old-time" golfers are happy that their old clubs will receive a new life with the Optimist junior golf program. Each year in July, Optimist International sponsors the Optimist International Junior Golf Championships. Competition begins at the club level. We love to hear when new programs take hold in a community. Great job Pembroke Pines Optimists. Many thanks to you and your supporters. Optimist Clubs share an important mission: to bring out the best in children. Through their positive, upbeat vision, Optimist Club members provide creative, fun and needed activities in their communities. 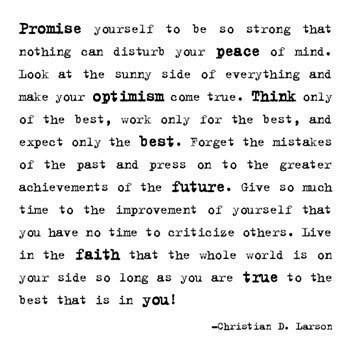 Start or join an Optimist Club today and make a difference in yours. Link to the Optimist International district and club directory. Thirty children felt the need for speed when the Optimist Club of Columbia, Missouri hosted the 71st Annual Mid-Missouri Soapbox Derby in June. The drivers ranged from 8 to 17 years of age, boys and girls. Advancing to the next level of competition in Akron, Ohio were Trevor Tatlow and Kelsey Zwonitzer of Columbia and Kaylor Wright, a 17-year-old from Houston, Texas, who placed first in the master’s division. According to the Optimist Club organizers, the soapbox derby is more than winning prizes and advancing in competition. It is also a day of family fun where everyone learns teamwork and good sportsmanship. As with any Optimist Club activity, the community is encouraged to get involved and this year some local celebrities got in on the action with two adult-size soapbox cars. In the first race, Columbia Public Schools Superintendent Phyllis Chase beat out University of Missouri Chancellor Brady Deaton. In the second race Mayor Darwin Hindman nosed out Boone County Presiding Commissioner Ken Pearson. What a wonderful tradition Optimists! Keep racing forward. Photo courtesy of the Columbia Tribune, Julia Robinson photo. Sweet! There is just something about pancakes and service clubs. 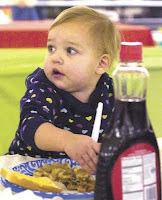 Many clubs choose to hold pancake breakfasts or suppers as a way to raise money for their cause. I think they are popular because simple and fun events -and food - have an uncanny ability to draw people together. You will find conversation, gossip, friendship and more every time the word pancake is uttered with the word fundraiser. Plan your pancake breakfast today and you can share your Optimism with the whole community and raise a few dollars for your cause in the process. Simple how-to-host a pancake breakfast ideas. This link was sent to me by Don Keating, S/T, Optimist Club of St. Andrews, SC. Kids don't recognize difficulty as impossible. They just go to it and get it done. Same for Optimist Clubs. What we do as Optimist Club members is not always written or easy; but like this little guy in the video, we imagine what can be and just do it. Enjoy! Every year since 1937, Caldwell County, Kentucky has honored the tobacco farming heritage of the community with the Black Patch Parade and Fair. Although the tobacco aspect has lessened over the years, the legacy that the cash crop left on the community has not. That's why the Princeton Optimist's selection of Parade Grand Marshall for 2009 is significant. The Optimist Club chose Glenn Martin, "a valuable asset to the community in the form of his history and information on Caldwell County." Mr. Martin has been the county historian since 2005 and spent all but two of his eighty-two years in Princeton. 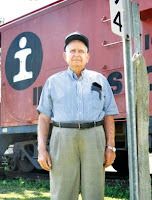 He resides on the land of his family's original homestead, he can recall mud roads and farming, and following a two-year stint in the army found his lifelong career in the railroad in his hometown. His colorful life includes encounters with hobos during the Great Depression and the growth of Caldwell County, a full-time avocation that he celebrates by documenting and sharing its history. Optimist Clubs share rich legacies in their communities, with members who personify history, growth and change. Recognizing their stories is just one way that Optimist Clubs make a difference with adults as well as children. Congratulations Mr. Martin and the Optimist Club of Caldwell County. Thank you for sharing your stories. Optimist Clubs are known for teaching respect for law so finding that the Optimist Club of Hillsborough, New Jersey was partnering with area businesses to raise funds for an officer in need was not surprising. Sharing compassion is just a side benefit of any Optimist Club experience. Beginning Aug. 24, a week-long fundraiser will benefit David Wilson who has been battling leukemia since November 2008. Participating businesses have pledged to donate a percentage of their sales revenue on a given day to go to the Wilson 10-33 Foundation. Seventy thousand dollars has been raised by the group so far to aid in chemotherapy treatment and financial support for Officer Wilson. The 10-33 Foundation represents the police code for an officer needs assistance. The Optimist club and business owners are part of the community-wide relief efforts that have included a motorcycle ride, blood drive, and picnics on Officer Wilson's behalf. What a caring community! 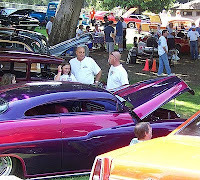 More than 250 entrants graced Sylvan Park this year for fun and prizes at the Annual Optimist Club of Redlands, California Car Show and Chili Cook-off. It's a juried event with only "nice cars, done tastefully." According to an Optimist spokesperson, they spend a lot of time speaking to the car owner, but primarily the car speaks for itself. The Optimist Club puts more than $60,000 into the community each year for youth projects. Approximately $20,000 comes from the car show. What a great way to channel entertainment and hobbies into positive community service. With the summer coming to an end, it's time to say goodbye to swimming pools and splash pads. What's a splash pad you ask? It is what you think - another way to beat the heat and keep our children entertained for hours. 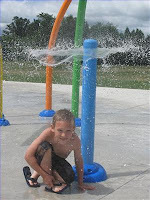 The Optimist Club of Moore, Ontario helped the Corunna Athletic Park create this water playground that features above-ground interactive water toys such as water turrets, buckets and fountains. The St. Clair Township matched the other half and plans to cover the $7,000 water bill each year. This is an example of another great way that Optimist Clubs can work with their government officials to make their community a great place to live and raise a family. I love pictures! As they say, a picture says a thousand words. Please enjoy this quick slideshow from the Optimist Club of Knoxville, Tennessee, a brief look at the Ijams Nature Walk. Each year, the Knoxville Optimists sponsor the tour to let students experience wildlife in their natural habitat. There is both a classroom setting and outdoors experience, and both are hands-on with Optimist Club members and the Nature Center interpretive staff helping and teaching the children. Thanks to the Optimist Club of Knoxville for sharing the story and the pictures. Congratulations to Marc Biunno, a Language Arts and Journalism teacher at Roosevelt School, on being named one of the Westfield Optimist Club's Intermediate Teachers of the Year. Each year the club singles out a teacher from each middle school.Biunno was honored by the club and the Board of Education also noted his distinction by presenting him with a resolution at the recent WHS Annual Awards Night. He received additional recognition that night when Liz Griesmer, an 8th grader who is one of Biunno's Journalism students, read a speech she composed in honor of her teacher. Congratulations to Mr. Biunno and colleagues and the Westfield Optimist Club for setting a positive example. 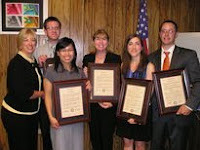 All honorees are shown in the picture above: Westfield BOE President Ginny Leiz (left) presented resolutions to: WHS teachers l-r: Louis De Angelo, Mabel Huynh, and Judith McLoughlin and EIS teacher Marnie Kirschenbaum and RIS teacher Marc Biunno. A thought came to me today as I was sifting through Optimist Club news looking for back-to-school topics which, by the way, so far have been very few. 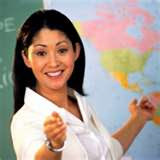 Optimist Clubs frequently recognize students, scholars and athletes, but very few recognize teachers and educators. I don't know of any that recognize classified or support personnel. Hold an essay contest where the students nominate their favorite teacher. Hold a poster contest where the students draw their favorite teacher. Ask the PTA or PTO to help find the most inspirational teacher. Ask teachers to nominate their colleagues. Have the principal recommend likely candidates for teacher of the year. One of the greatest things about Optimist Clubs is they have the ability to start-up and carry out meaningful programs. This one might be just the right thing for your community. Do you have any suggestions for getting this program off the ground? What about prizes? What would be appropriate? Leave us your thoughts please, or send them to me at linda [at] newoptimistclub.com. It happens annually on July 1. What is it? Canada Day. On July 1, 1867, the British North American Act was signed making Canada a united country. 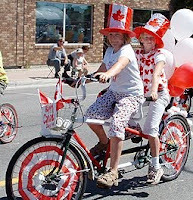 This federal statutory holiday is celebrated throughout Canada with fireworks, parades and barbecues; all of the traditional elements that bring a community together. This year, the Optimist Club of Bright's Grove, Ontario was right in the middle of the celebration. They hosted a bigger parade than usual and recruited both decorated vehicles and bicycles to join the fun. Shriners, scouts and guides joined the Air Cadets Band and Flag Party, First Hussars, fire trucks and the Forest Legion Pipe Band. Finally, the Optimist Club hosted rides, games, clowns and music throughout the day. Happy Anniversary Canada. Please don't take my delayed posting as a slight; but as a recognition of your achievement and community. Approximately 12,000 students have benefited from the Optimist Club of Sheboygan, Wisconsin Back to School Basics program over the past twelve years. That's one thousand children each year who have, along with their families, received everything from paper, pencils, glue, crayolas, folders and notebooks all the way to toothbrushes. The club is anticipating longer lines at this year's event and have arranged for Spanish and Hmong translators to assist with English as a second language students. 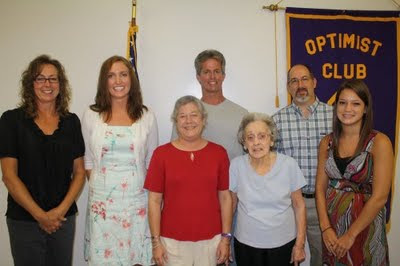 The Optimist Club serves as the coordinator of the activity. They donate supplies and purchase others with donations from area businesses and individuals. 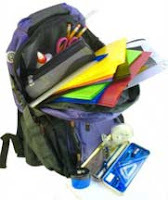 The school supply giveaway takes place during school registration. Families stop by while enrolloing and the Optimist Club members help them find what is needed for their child's grade year. What a great way to send kids back to school with optimism! "It's mainly to get kids outdoors and do something with their parents or grandparents," explained Doug Thompson, member, Optimist Club of Solon, Iowa as he described the festivities that surround Solon Beef Days. Of course there is beef - the main food attraction, but more important are all the family activities that keep the kids moving. The most popular Optimist Club sponsored children's attractions were the Big Wheel Trike Race and the Fishing Derby. Families also enjoyed a hay bale toss, music, food and friends during the 38th annual event. Community traditions are important. What tradition is your Optimist Club involved in? Please leave us a comment and tell us all about it. In most communities school will be getting started in a matter of week or even days. Here is a simple project idea that lets you interact with a school and students on a regular basis: honor a student or students every month. Culminate the project with an annual student of the year awards presentation. This is a scalable project. Choose one school or more and let the principal and teachers know your criteria. Enlist their help in identifying potential candidates for the honor. Choose the winner, give them a token of appreciation and get their picture in the paper as part of the recognition. As the school year comes to a close, invite all the students and their parents to attend a special dinner or picnic in their honor. Your Optimist Club will build lasting relationships with schools, students and parents with this one event. You will also find participants for scholarship contests and youthful hands to help your club carry out projects. The Optimist Club of Marco Island, Florida uses this approach and in this picture school principal George Abounader is shown with the Marco Island Middle School finalists for the Student of the Year recognition. The Optimist Club of Waterdown, Ontario recently held a free pasta dinner for the community and more than 350 people turned out for the food and fun. Coordinated by the 11-member service club, this event helped stock the food pantry as visitors were asked to bring a non-perishable food item in exchange for admission, but according to Don Johnson, Optimist Club member and event coordinator, the real reason behind the activity was community-building. What activity has your Optimist Club conducted recently to help build relationships where you live? Tell us about. Leave a comment or send some pictures with the story to linda [at] newoptimistclub.com. The Optimist Club of Raleigh, North Carolina was recently recognized for twenty years of keeping the highways clean. With more than 6,000 organizations, businesses, and groups participating in North Carolina, it might be easy for the efforts of of one group to be lost in the mix, but the North Carolina Department of Transportation makes sure to recognizes the 10, 15 and 20 year anniversaries of their Adopt-A-Highway sponsors annually. It was important to me to see that the Optimist Club was included. Projects like this build cohesiveness in a club and are meaningful to the community. It takes a lot of commitment and a lot of volunteers to Keep America Beautiful. Thank you Optimists and others throughout the United States for volunteering. Click on the Keep America Beautiful link to find out how your club can get involved. Trivia question: Do you know the name of the Native American Indian from the Keep America Beautiful commercials and shown above? Find the answer in the labels for this post. The first line in the article "Celebrating 30 years of service" confirmed that the Optimist Club of Valley Forge, PA gets together every five years "for a good time and to celebrate their unique mission." Say what? My Optimist Club gets together every week to fulfill the Optimist International motto of being a friend to youth. Could it be true that they only get together every five years? Of course not. What is left unsaid is they only celebrate their accomplishments every five years; that is, they only pat each other on the back, award each other for service and brag to each other about what they have done in a formal setting every five years. The rest of the time they are leading sports programs, hosting scholarship contests, involving students in community service, holding informative club meetings and recruiting new members to carry out their mission of being friends to youth. This made me think; one of the first things we tell our leaders is to give thanks to members, recognize them and celebrate their accomplishments. Could it be we do that too much? Has our mission of service gotten lost in the social activities and glad-handing? The key to survival for any organization is to have a good mix of both social and service activities that creates a positive experience for all. That means as a leaders and members, you must go out of your way to make sure everyone - members and guests - feel welcome and that their voice and service are welcome additions to the club. You must also take care to include everyone in projects by letting them know why your club does it and how to be involved. Finally, most people are busy and they don't need a social group to eat with - they have family, friends and co-workers for that. If your group meets over a meal, make sure that there is a speaker or program at every meeting so that everyone has the opportunity to learn something new every time your Optimist Club gathers. 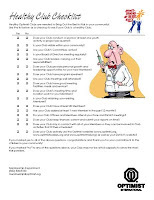 To the left, the "Healthy Club Checklist" outlines many other steps you can take to ensure that your Optimist Club is doing its best to serve its members and community. Download a copy and share it with your club's board of directors today. Entrepreneurs are Optimists; they have to be, even when they are in grade school. I love this project on so many levels: adults encouraging children to be enterprising; children hosting an old-fashioned lemonade stand and all of the above giving to a cause they have determined they want to support. Hooray for the "Lemonade Kids!" Ranging from 5 to 15 years of age, they describe their project as "Helping the Homeless One Squeeze at a Time." They use the lemonade stand to conduct three drives per year and all money that is earned is given to the Center for Women and Children, a ministry of the Miami Rescue Mission. 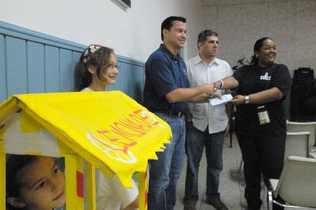 The Optimist Club of Miami Springs, Florida does their part by matching the funds raised by the Lemonade Kids. According to Optimist board member Cristina Vico, the club is well-known for their sports programs, but members chose to respond to this activity because the children "learn to work with each other and working builds a solid foundation of service for them. It's a humbling experience." The Optimist Club of Princeton, Kentucky hosted a free back-to-school bash at the City-County Pool for all school aged youth from kindergarten to 12th grade in Caldwell County on August 5. An Optimist Club spokesperson commented that sometimes the simple projects meet the needs of the community the best. The free swim party was a great way for children to beat the heat and renew old friendships as the summer winds down and thoughts return to the classroom. The club struck a deal for admission and helped get the word out throughout the community. The kids did the rest, including paying for their own refreshments at the concession stand. I think it is a Midwestern phenomenon. 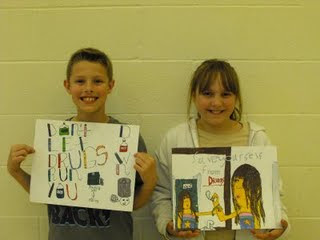 The Illinois and Missouri Districts host poster contests for elementary school students to speak out against drugs. The Optimist Club of Grain Valley, Missouri recently displayed their winning posters and artists on their blog. Shown here are Justin Sackman & Abby Hammontree. Justin was also the winner at the district level. The poster contest is a fairly simple process and one that teachers look forward to each year. Teachers can plan lessons around substance abuse prevention and kids can creatively record what they have learned. 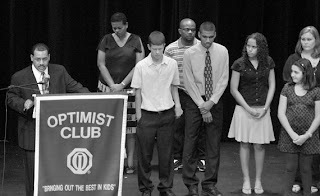 The Optimist Club then awards the students on their creativity. If your district conducts a poster contest, please send me a message and some details of your event. I would love to share the information with others. Thanks! Twenty-two young speakers representing schools in Grand Cayman and Cayman Brac participated in the First Annual Optimist Oratorical Contest organized by the Optimist Club of the Cayman Islands in June. The program is a key project of Optimist International as they are the only international service organization to reward students for excellence in public speaking. There are three levels to the competition: Club, Zone and District and all speakers must begin at the club level. The top three finishers at the District level earn college scholarships, but all students are rewarded with praise and encouragement to keep reaching for their full potential. 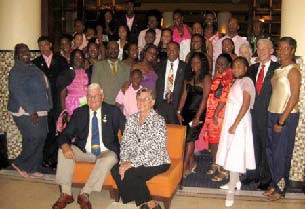 The Optimist Club of the Cayman Islands is nearing its first anniversary. According to Charter President Dr Andrea Campbell, the club welcomes new members. The club meets on the first and third Thursday of each month at 6:30 pm at the Hibiscus Room of the George Town Hospital. The City of Jackson, New Jersey and Mayor Mike Reina praised the Optimist Buddies at a recent Jackson Township Council meeting. He recognized the group, made up of forty students, for service to their community, especially for the effort of kids helping kids. The Optimist Buddy program is coordinated by the Optimist Club of Jackson. They help the students find and perform work with Community Alliance programs, enabling children with special needs to participate in sports activities and other pursuits. Mayor Reina congratulated the group and commented, "You can't feel anything but proud of these students. It's just another fine example of how Jackson comes together as a community." Twenty-five young delegates represented Anguillan Junior Optimist Clubs to the Junior Optimist Octagon International (JOOI) Convention this year. That is the largest number of delegates to ever attend a convention from one district. The convention attendees had the opportunity to attend education and networking sessions on leadership and community service and to meet with the Board of Directors of Optimist International. Shown with the delegation here are Don Sievers, President and his spouse Anita; Theo Golding, Chairman of the Board; and Mark Shriver, President-designate and his spouse Patricia McKay, M.D. Each year the Optimist Club of Garner, North Carolina honors a beloved Optimist Club member and ensures that his legacy of serving the youth in his community lives on by awarding the Abe Wade Scholarship to area high school seniors. Receiving the award this year were Amanda Jordan and Jamie Stanton of the Garner Magnet High School. Shown with them are members of Abe Wade's family, his spouse Dena Wade, son Sammy Wade and daughter Cindy Wade. Mr. Wade was a charter member of the Garner Optimist Club. The club has been serving the community since 1966. Optimist Clubs came together as Optimist International in 1919.